A couple weeks ago, when a friend asked me who I was backing for president, I equivocated, explaining that we had a long primary season ahead of us and that I wasn’t prepared to get too invested yet. Ah yes, the controversy of Elizabeth Warren’s Native American ancestry. Most would agree that her decision to release DNA test results last year was a serious misstep; having a Native American several generations back in her family tree doesn’t prove much of anything, or give her any claim to the identity or culture for that matter. At the time I could sort of understand it as a strategic move since it seemed like an attempt to position herself as the president’s main adversary amongst a crowded Democratic field. Plus, Donald Trump has been (expectedly) much more offensive in this debacle by dismissively nicknaming Warren Pocahontas, and hey, he really did offer to donate $1 million if she proved heritage. However, at best, it was a blunder given that Warren handled the situation without a lot of sensitivity, and really, anytime you try to stoop to Trump’s level to beat him at his own game, you’re probably losing. Ultimately, I was willing to overlook this incident (not that I as a non-indigenous person was the one owed an apology) despite remaining wary. Well, consider me even warier in light of the new revelations that she filled out her race as “American Indian” on her Texas bar registration form back in the ’80s. We’ve known in the past that academic institutions have listed her as a “minority” hire, but until now there’s been no proof that Warren listed herself in this manner. We may never know if identifying herself as a Native American gave her any advantages in her career, but it seems fairly clear that she thought it might. So far, the media attention on this story has been minimal, and even as a Warren fan, I’m displeased with that. This needs to be hashed out in the court of public opinion now, well before the election cycle kicks into high gear. Should this situation eliminate her from contention or is this something Democratic voters are willing to accept an apology for (she has apologized again) because it happened decades ago and we’re all more conscious about race and cultural appropriation today? I don’t have the answer to those questions, in part because I haven’t made up my own my mind. However, I’d like to see more discourse on this topic so that we can all learn from it and reach a broader consensus on whether we feel Warren can still be the nominee. It would be a grave error to let it slide under the radar until mid-2020 and catch people by surprise with it then. 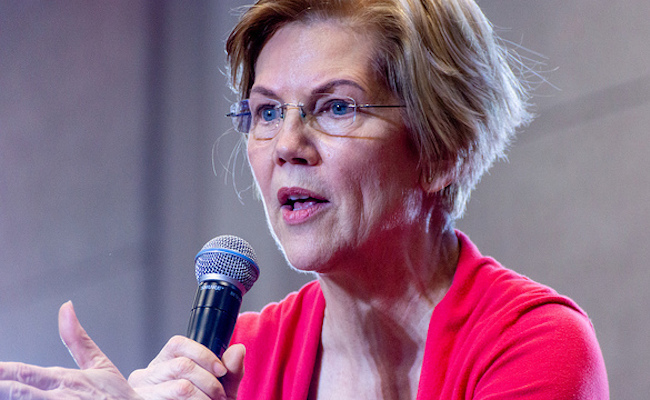 With ideas like a wealth tax, Warren already stands out from the field as one of the more progressive candidates. She brings a refreshing perspective about income inequality and corporations to D.C. that will no doubt be attractive to a lot of liberal voters. The question at hand is whether we can entrust her with these responsibilities or if we’d prefer her to pass that baton to someone else. So let’s get talking! I AM FOR WARREN IN OUR SENATE!! SHE HAS THE SMARTS AMERICA NEEDS. In case you missed it Iâll repeat what I wrote. She has stated, and her family backs her up on this, that she was told from childhood that she had Native American ancestry. So how again did she lie? She repeated what she was told by her parents. And in fact she does have at least one Native American ancestor. Add to that that there have been multiple investigations into her claims and in every case those working with her and those involved in her hiring and advancement have stated that her ethnic background played no role in their decisions. Many of these people further stated they had no knowledge of what her ethnic background was. Seems to me that, given the facts in evidence, anyone still pushing the narrative that Warren knowingly lied is partisan down to their guts and really should not be taken seriously. Mary "poorly" is not the word to describe her invented lies to displace others in college and jobs by claiming Indian ancestry. This blond hair Blue eye liar had less Indian DNA traces than the average European. She is far from presidential material. there seems to be several people on here who think "she handled the issue" of her native ancestry "poorly". Like how ? Since none of you are her, why do you think she handled it poorly ? She did a good job at what she did, and had no desire to run for President, but once she decided to do that, she basically was challenged by trump to prove it, so she had the DNA test to clarify things and there was a trace of it, not enough to qualify her for special privileged but that didn't stop Shelly W from claiming out right lieing and speculating on her motive. And now Brian says since she voted for crook Hillary instead of Bernie in 2016 [midterms] when neither Hillary or Bernie were running for anything, that means Elizabeth doesn't support Medicare for all, he's going to trash her too. They ALL should be banned from this sight permanently.